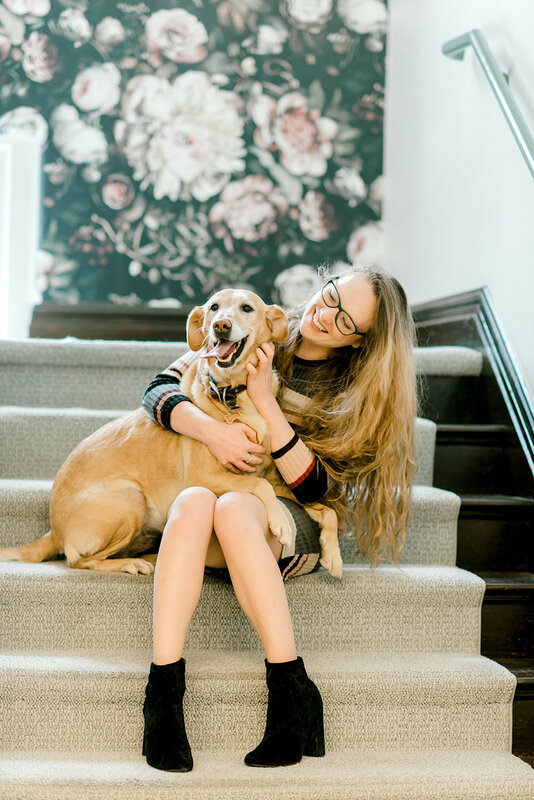 We ran into our friend Ali of Ali & Garrett Wedding Photographers at a networking event recently and got to talking about how we bring our dogs to work. She insisted on coming in to do a photoshoot with our dogs! Maria Elena Headpieces even sent special dog tiaras for the shoot! We’re guessing people may be surprised to know that some of us bring our dogs to work, since we’re a bridal salon. 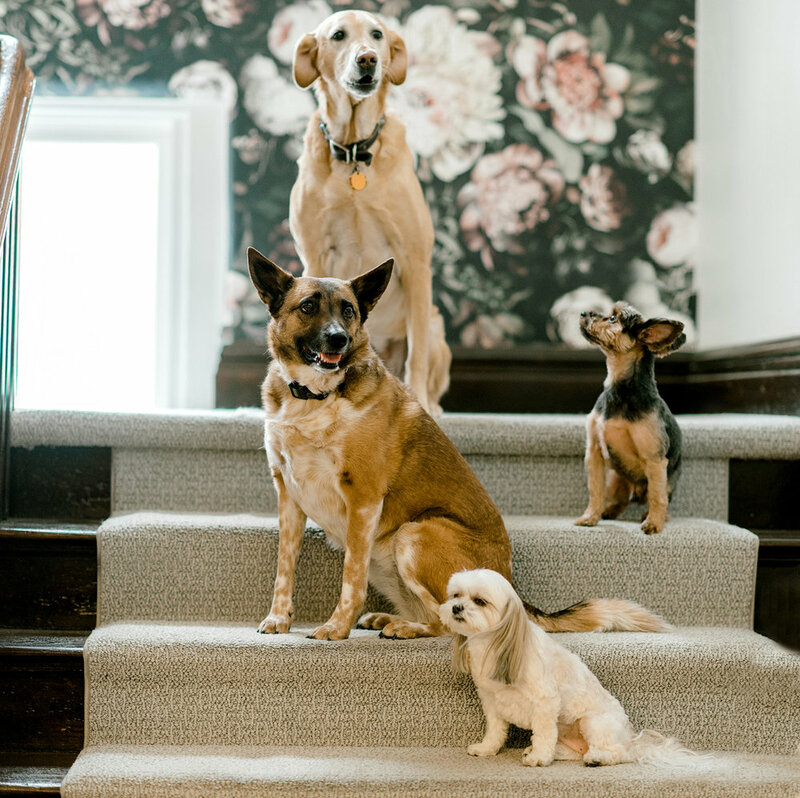 We’re lucky enough to have an upstairs office area where our pups love hanging out (many of us spend a lot of time in the office during weekdays while we’re processing orders, working on our marketing, and providing support to our team of stylists, among lots of other operational and management tasks). We take a lot of pride in our positive work environment, and it’s important to us that we all feel like a big family. Our dogs have come to be a part of our LWD family, and they bring us so much joy (which I’m sure will be obvious from your photos!!). Indiana is a cattle dog/shepherd mix and her mom is Kelly, LWD’s Creative Director. Indy’s mom describes her as a once-in-a-lifetime pup who is smart (a little too smart sometimes), sensitive, and gives the best hugs. Marley is a free spirited golden retriever/yellow lab mix and her mom is Lauren, LWD’s Assistant Manager. Marley’s mom describes her as independent, very affectionate, and a total goof. Jake is a brave Yorkshire Terrier with an adventurous spirit who loves to snuggle. His mom is Deana, the Operations Coordinator at Little White Dress. Miley is a Maltese/Shi Tzu and is the sweet fur baby of Anna, LWD’s Manager. Miley is a total princess who thinks of herself as a human child more than a pup. She enjoys going on every adventure possible with her human companions – as long as she is being held and snuggled, she is happy!